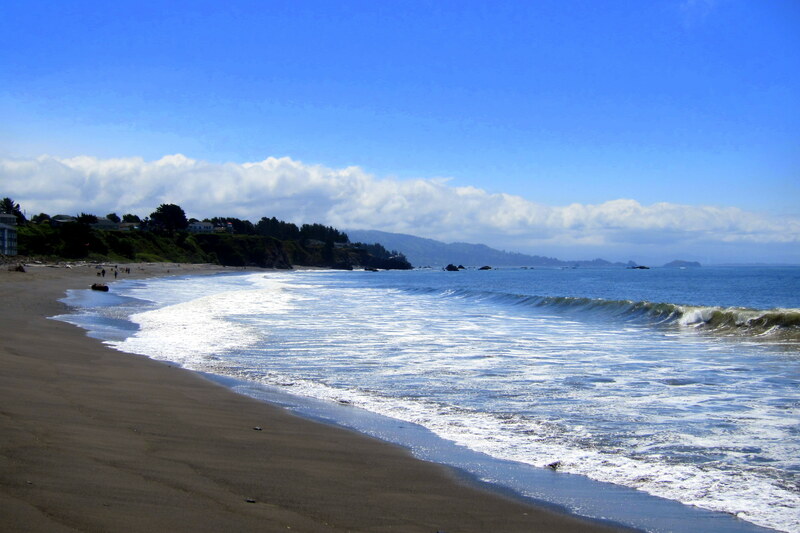 Wednesday, May 13, 2015: Woke up to brilliant sunshine on the northern coast of California. As Kit continued to slumber, I enjoyed a walk to Casper Beach which lies across the road from our campsite. 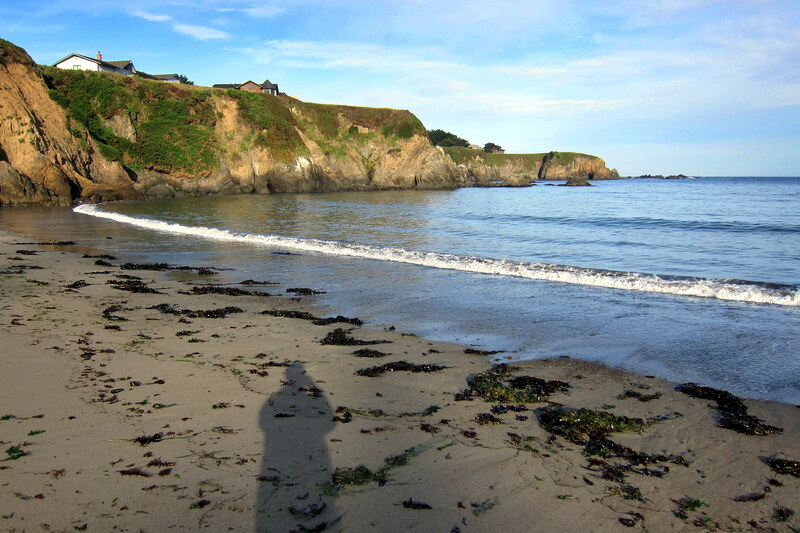 The beach was deserted…..there was only the shadow of a fellow who was not smart enough to sleep in on this cool crisp morning. 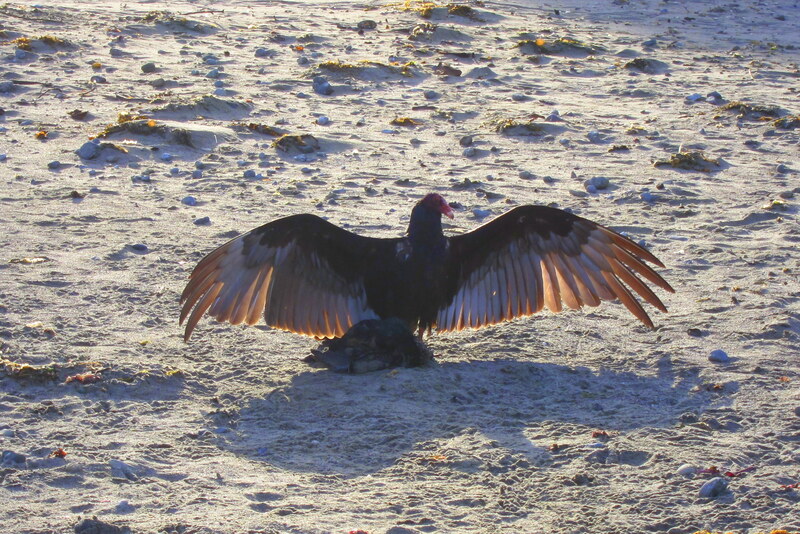 There were also, a number of seagulls and other birds about to keep me entertained…..including this Turkey Vulture guarding his breakfast. 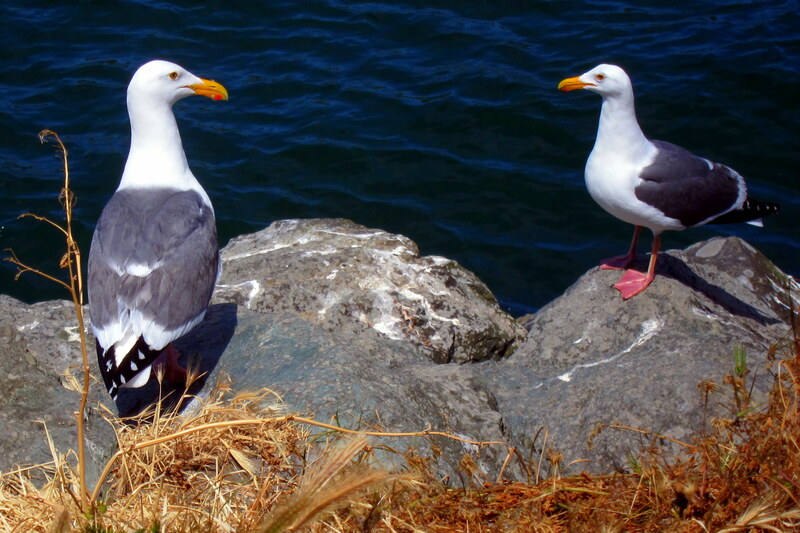 The bird sat in that pose the entire time I was on the beach. Not sure if he was trying to get warm or if there was something wrong with his wings…..if the later, then he could always fly Delta since he only had the one carrion. After an hour patrolling the small beach and picking up a handful of shells, I made my way back to the camper, dumped the sand out of my shoes, and joined Kit for breakfast. 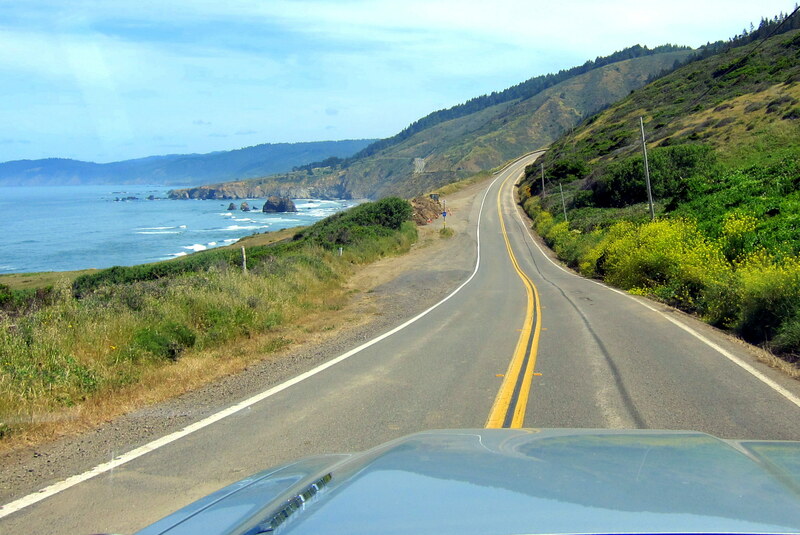 By 1000, we were pulling out of the campground and continuing north on the Pacific Coast Highway. The temperature was slowly warming into the mid 50’s as we made our way up the coast. 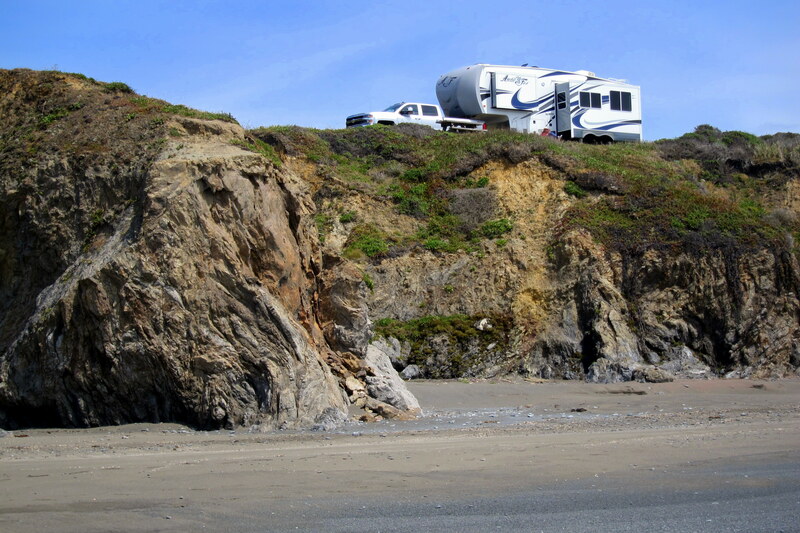 Kit and I had only traveled about fifty miles when we came to a pretty little cove that featured a California State Beach Campground situated on a bluff overlooking the ocean. There were only a few other campers and the place looked enticing so Kit and I made a quick decision to pull in for the day. Ahhh, the beauty of traveling with no itinerary! Opportunities such as this arise frequently on the road and the ability to take advantage of them far outweighs the uncertainty of where to stay at the end of the day…..we wouldn’t have it any other way! Hey, that rhymes! After self-registering, we selected a very nice spot that afforded us the best views out our windows. 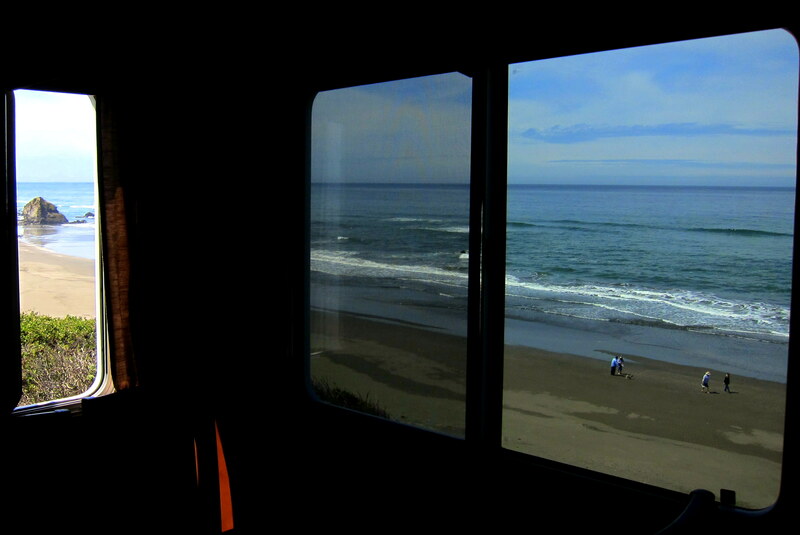 The temperature had warmed to a comfortable level so we opened all the windows to let the fresh ocean breeze flow in. As Kit sat outside and enjoyed her book, I decided to find my way down to the beach to explore and partake in some kite flying. One has to work to get from the campground to the beach…..for some reason the only convenient access was from the day use area, a mile to the south!?!? 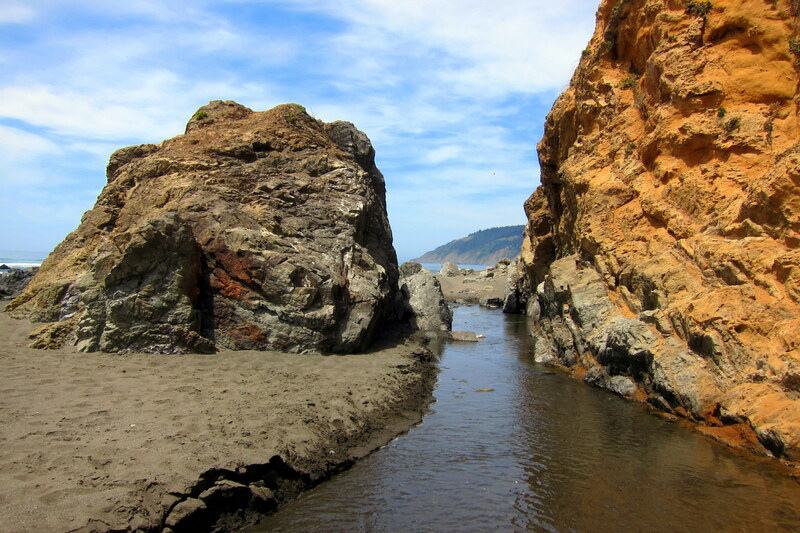 However, there is another access route that leads down a steep path to a creek containing mountain snow-melt flowing into the Pacific Ocean. Here, you have two choices….feet wet, or feet dry. I choose the former and walked barefoot in the creek for about 25 yards, which demonstrated just how cold that water was…..yikes! 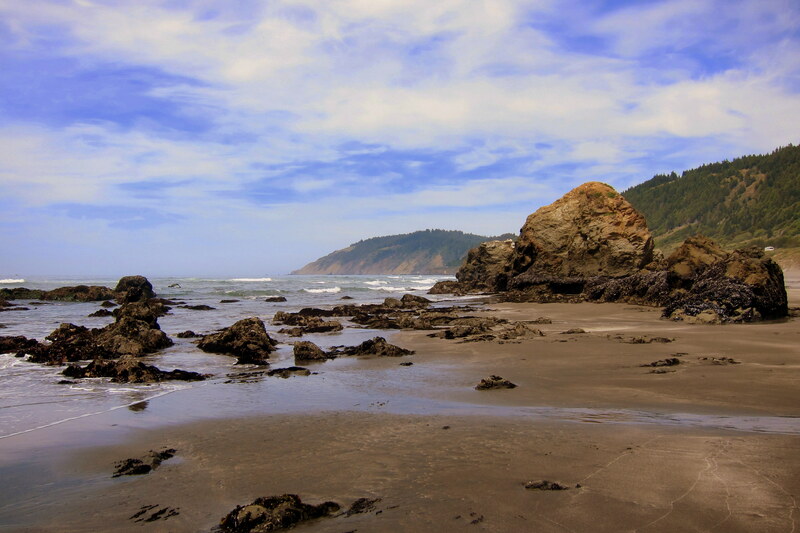 Once on the beach, and with shoes back on, it was like you were the first person to set foot on this desolate stretch of Northern California shoreline. 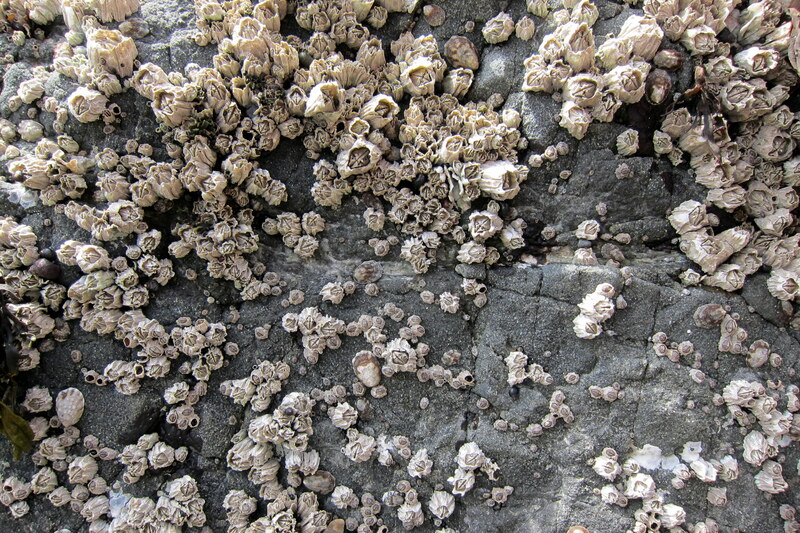 Timing was perfect as it is near low tide and the newly revealed rocks were covered with a variety of marine growth. 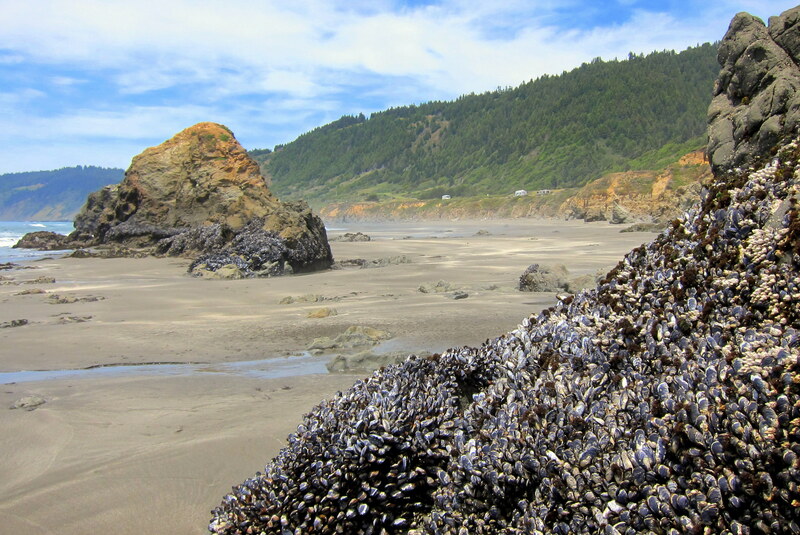 Such as these barnacles wiggling about. 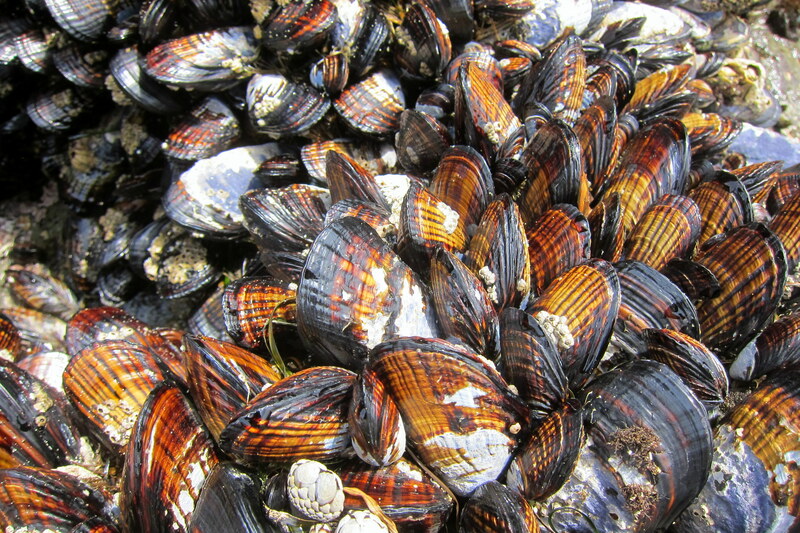 And these colorful Mussels closed up tight and waiting for the ocean, and their dinner, to return once again. 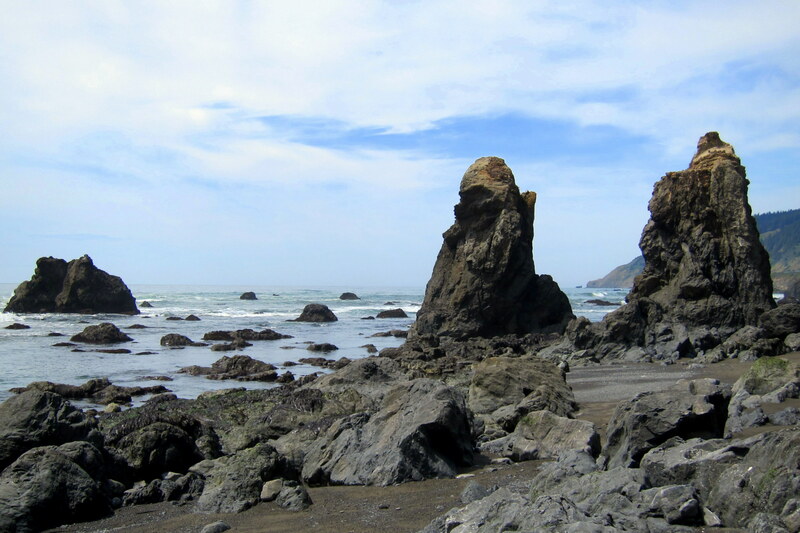 There are numerous large rock pillars, known as Sea Stacks scattered about. These were invisible or appeared as tiny islands a few hours ago and are now fully exposed at low tide. Walking amongst these formations, damp from the receding ocean and covered with organic life was a real treat for the senses. However, as the saying goes, “Time and tide wait for no man”, so I therefore heeded the call of the approaching tide and headed for higher ground. Thoughtfully, someone had secured a knotted rope to a stout post atop the bluff that I used to scamper up the steep hillside, saving me a good 30 minutes. 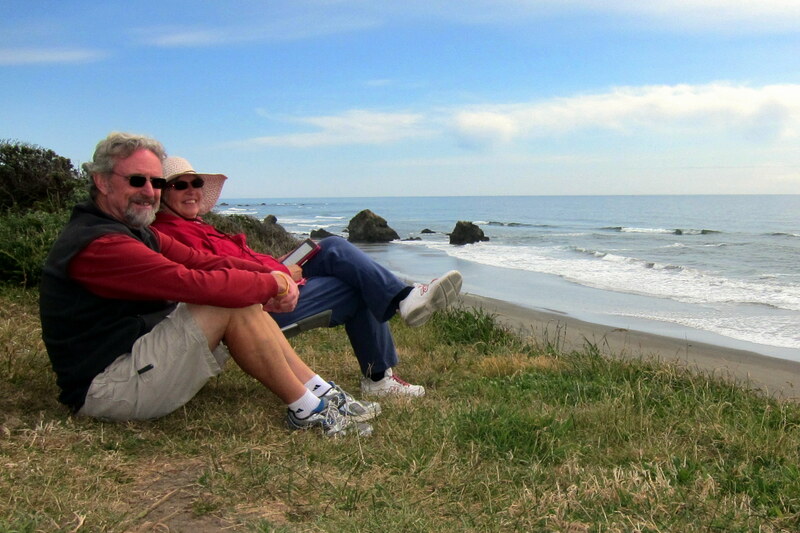 Relaxing next to Kit, we watched the incoming tide cover many of the Sea Stacks and most of my footprints. After dinner, Kit and I took a stroll along the bluff. At the far end of the campground we came across this pleasant couple, and stopped to visit. 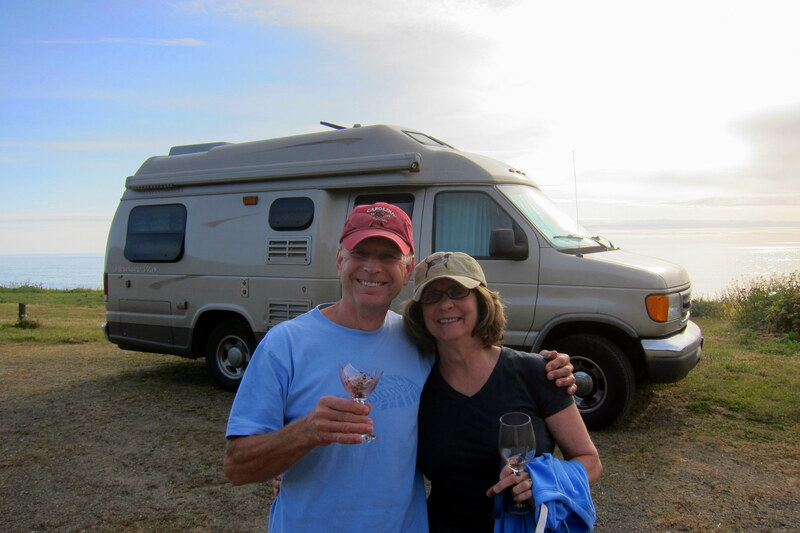 Dan and Marlene live in South Carolina and travel during the hot summers…..kinda like reverse snowbirds. They enjoy the flexibility and low operating cost of their Pleasure Way class B motorhome and have comfortably toured the country in their small RV. 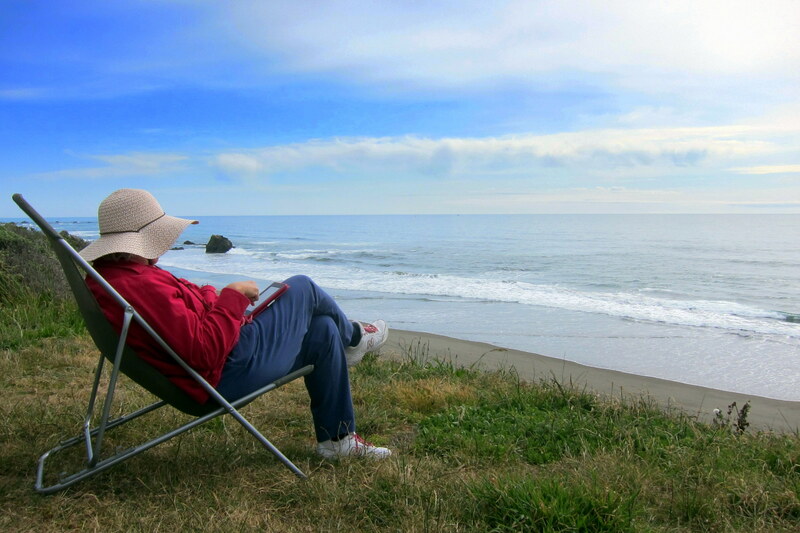 Kit and I have been noticing a trend away from huge Class A units toward the much smaller and more maneuverable Class B’s……especially among newly retired baby boomers. Back at our own campsite, we enjoyed an adult beverage as the sun slipped below the horizon capping off another great day on the road! Thursday, May 14, 2015: Lounged about and enjoyed the morning. Kit and I discussed staying an additional day at this very pleasant oceanfront state park, but we need to move on if we expect to arrive back home before the summer ends. At some point last night another camper pulled in and parked about 50 yards to the north of us. 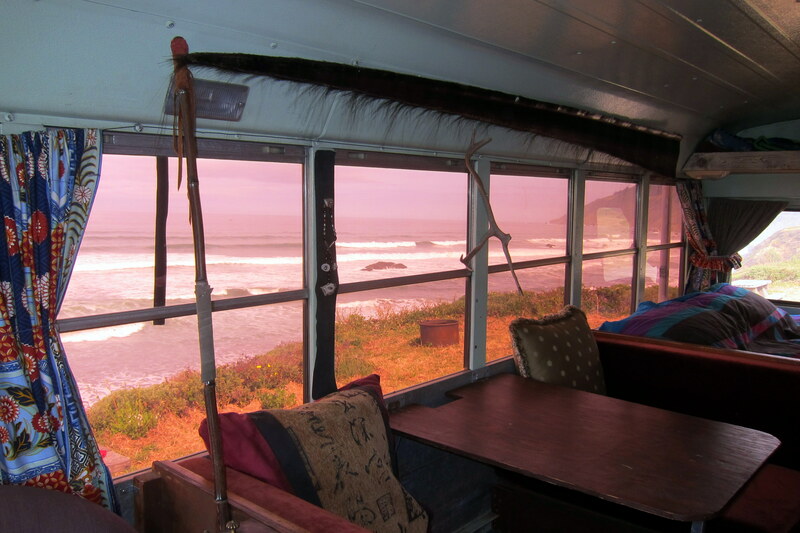 This converted school bus was the handiwork of a very interesting woman. Kathleen lives a few miles inland near Ukiah, California in a log home she built herself. An avid outdoors woman, she frequently comes down out of the mountains to fish, and last night caught her dinner by surfcasting from the shore. 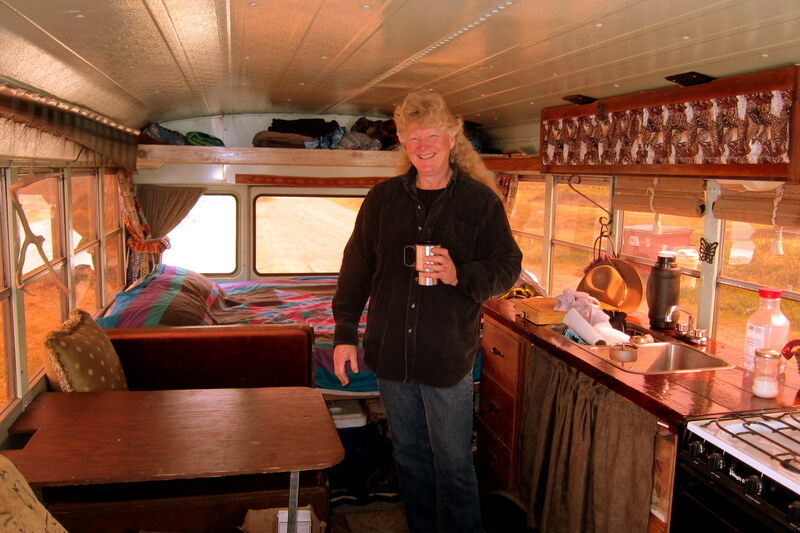 She graciously invited us into her camper and showed off the improvements she had made, including a really nice countertop made of a solid redwood varnished to a high sheen. Kathleen has decorated the inside of her bus with items found during her travels, including a length of Baleen from a whale beached in Alaska! 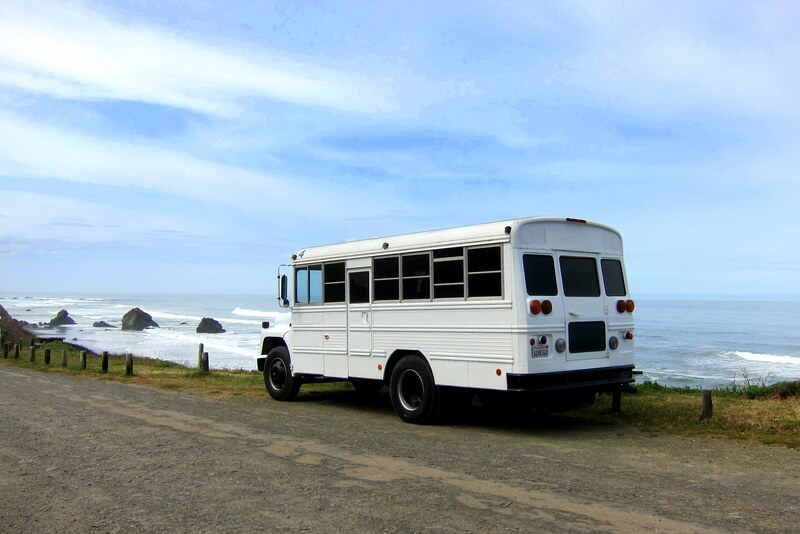 A very nice bus conversion created by a very creative soul. Her choice of covering the yellow school bus with white paint is intended to create a canvas for her to paint pictorials of her many travels…..with her skill and talent the finished products should be spectacular! Kit and I were underway at 1100 hours under partly cloudy skies and temperatures in the 70’s. 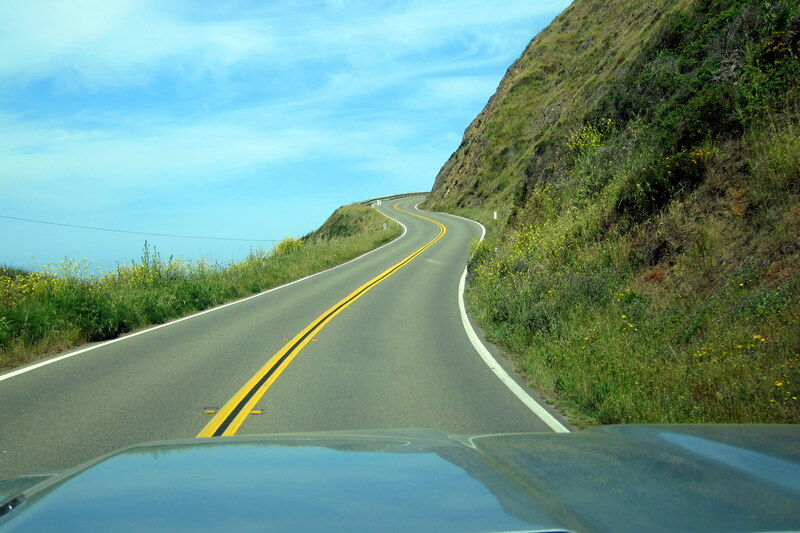 We continued north on the coastal highway and the road continued to be steep and winding…..a challenge for the average motorist and a bit more technical for folks towing a 12,000 pound trailer! 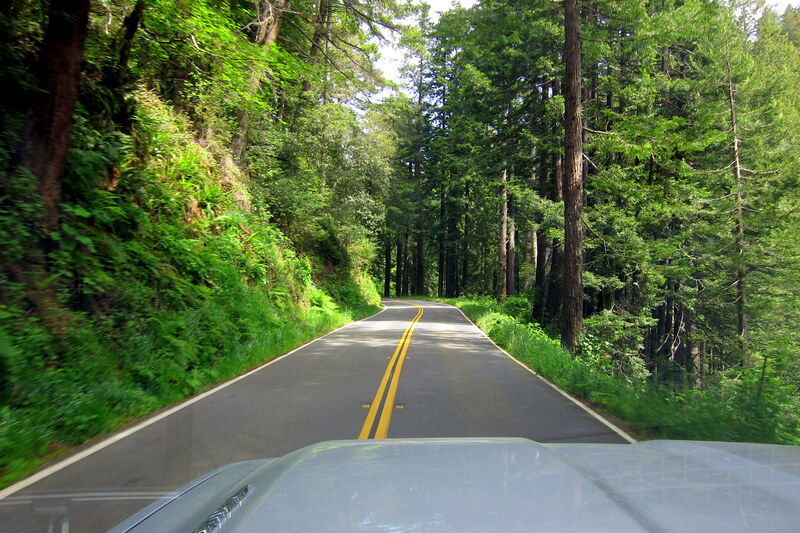 The absence of guardrails and shoulders added to the excitement, however the roads were very well maintained and the little traffic we encountered was cautious and patient as we lumbered along. 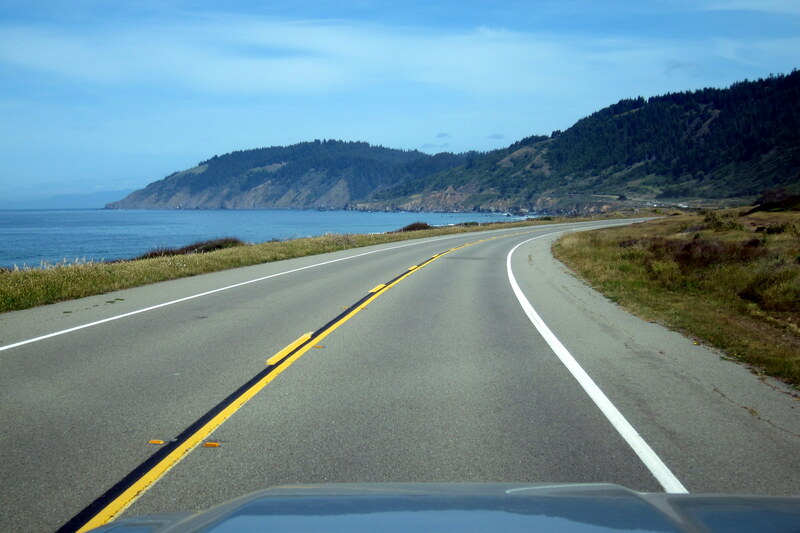 At the town of Rockport, the Pacific Coast Highway veers inland to avoid a particularly rugged portion of the California coast where the King Range National Conservation Area, also know as The Emerald Coast, is located. At the town of Riverdale, The Pacific Coast Highway (CA-1) merged with US-101 for the remainder of our trip toward the Oregon border. 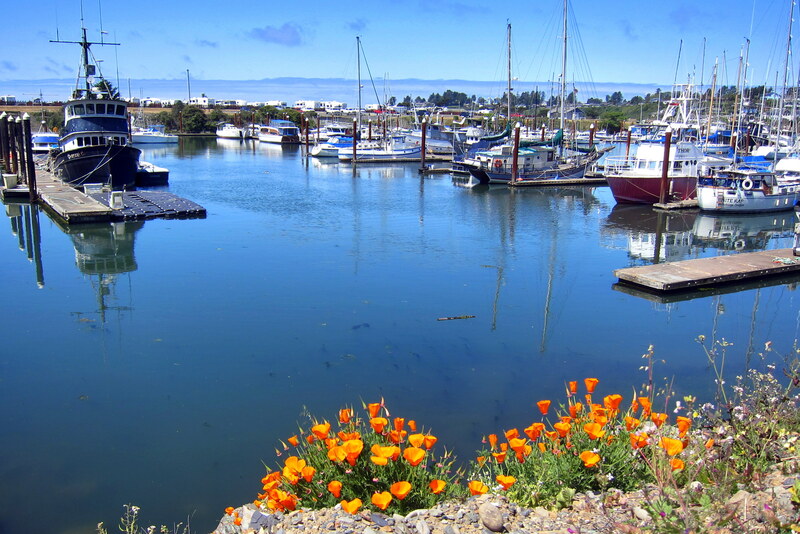 Approaching the village of Crescent City, one of the last towns on the Northern California coast, we pulled off and made our way to the Shoreline RV Park, a municipal campground located adjacent to beautiful Crescent Harbor. Unfortunately, we found it opens for the season tomorrow! However, fortunately as we were sitting in front of the shuttered office a man drove up in a Crescent City truck and offered to help. Matt is a fellow RV’r and apologized we missed opening day by less than 24 hours but he directed us to another nice RV park just north of the border. 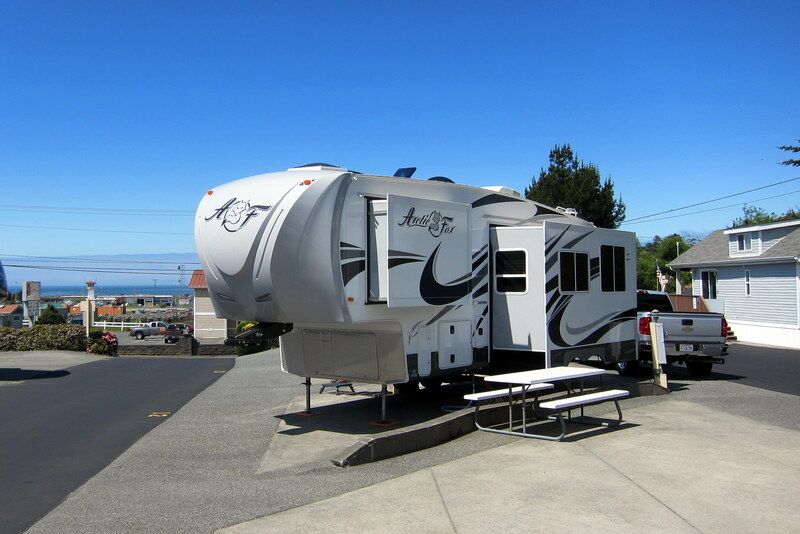 A relatively short 20 miles up the road is Harbor, Oregon and the nice, and convenient, Portside RV Park where we were able to select a suitable campsite for a few nights. 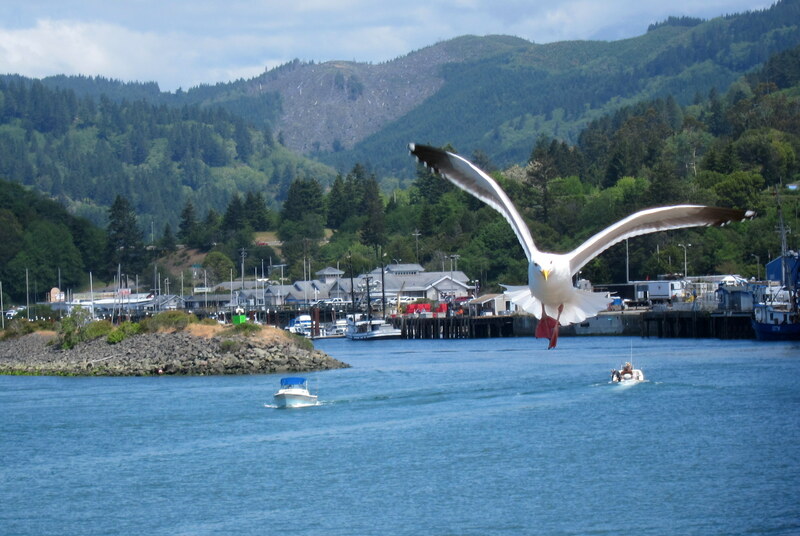 Friday, May 15, 2015-Harbor, Oregon: This town of 2,391 folks sits on the Chetco River where it meets the Pacific Ocean. The harbor shelters a mixture of pleasure and commercial boats protected by a natural inlet. 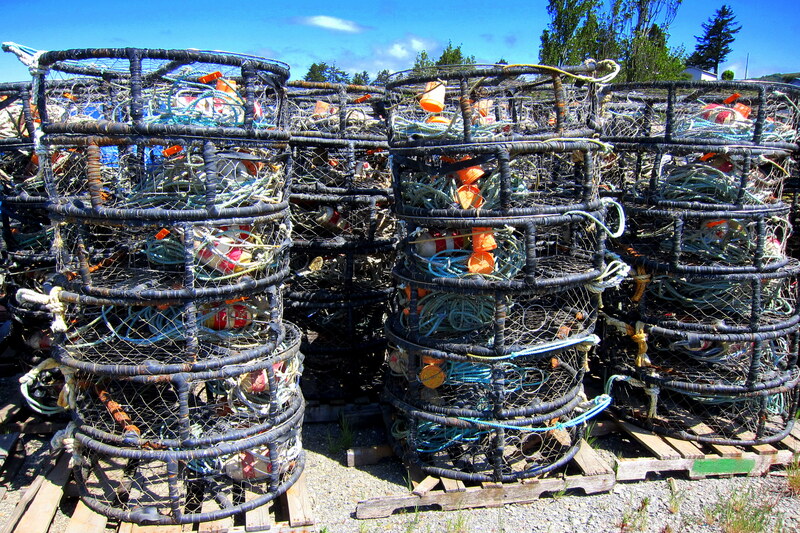 A small fleet of crab boats hunt for the delicious Dungeness crab using traps similar to ones used to catch lobster back home. And, like lobsters, you have to wonder about the sanity of the first person that thought: Hey…..that looks like it would be good to eat! I did sample some during our stay, and even though the crab’s name begins with dung, I found the meat sweet and flavorful. 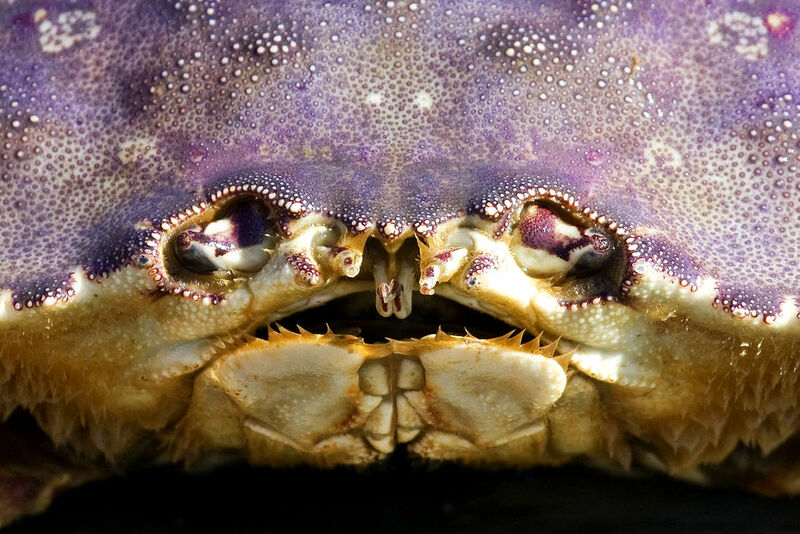 There are other live things in the harbor, while not necessarily edible, are a whole lot prettier. 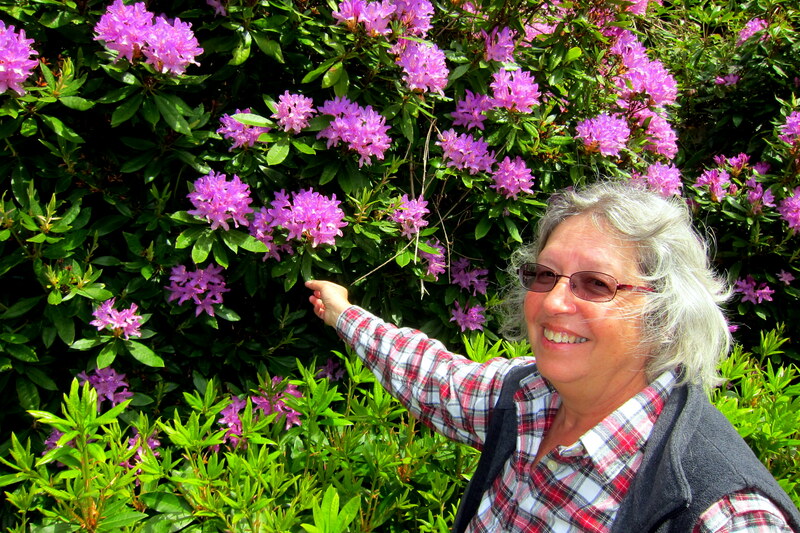 Oh…..and the flowers were nice as well! On the ocean side of the sand spit that makes up the harbor lays a nice small beach. And on the rock jetty that helps protect the inner harbor is a gathering spot for the ubiquitous seagull. Who frequently gather to people watch and presumably discuss the latest shoreline gossip. Or possibly share aerial intelligence on who in town had recently washed and waxed their vehicle. 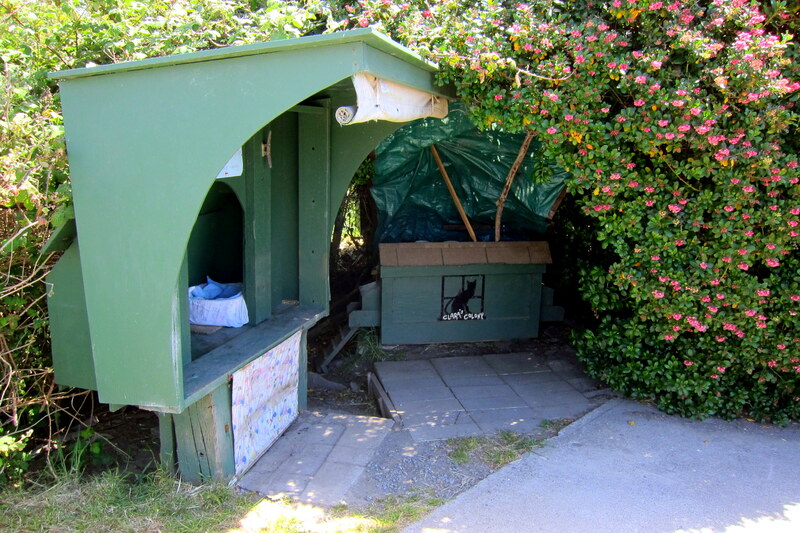 Apparently there is a fairly large feral cat population around the harbor…..to the extent that a kind citizen has set up a feline homeless shelter that one can donate food too. Never have we seen anything such as this, but what a nice gesture! With such thoughtful and pleasant townsfolk about there had to be a few weirdos…..like this scary looking dude lurking about. 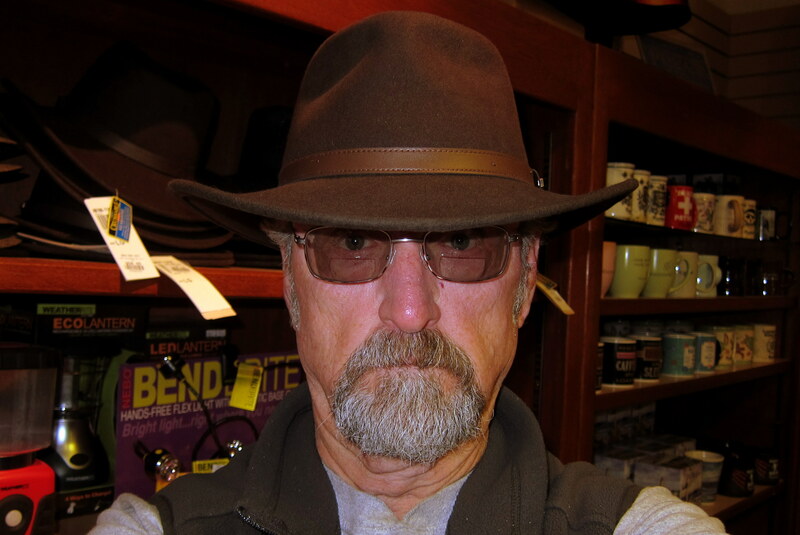 You know, I always try on hats but never buy one! Not much of a hat person, I guess. 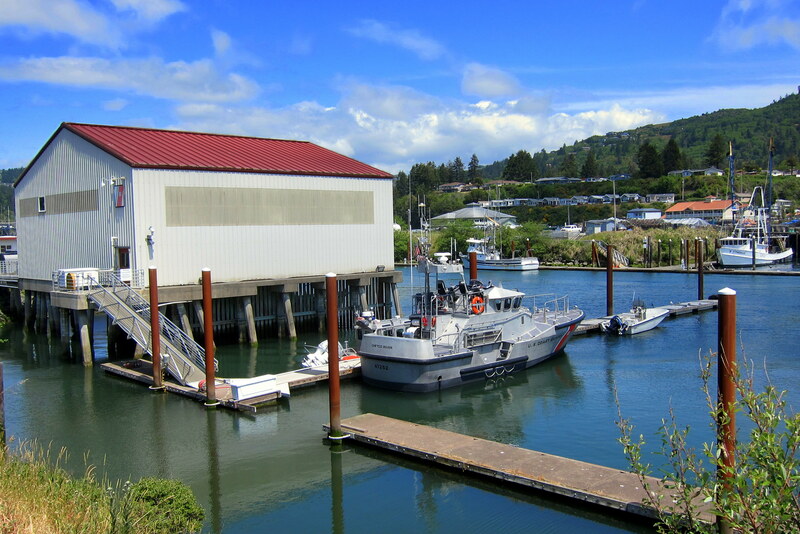 Sharing the harbor is a US Coast Guard station and their 47 foot Motor Life Boat. 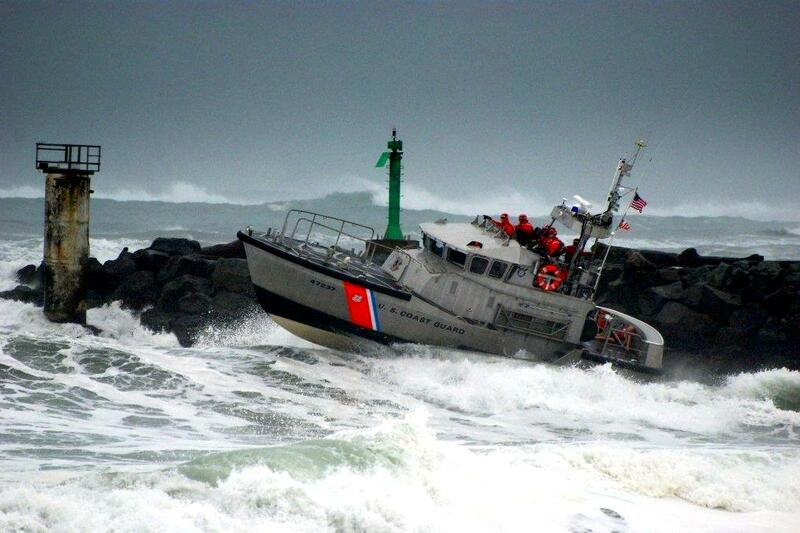 These heavy surf capable craft can self-right within 30 seconds if capsized…..pretty impressive! Photo Captured From the Internet. 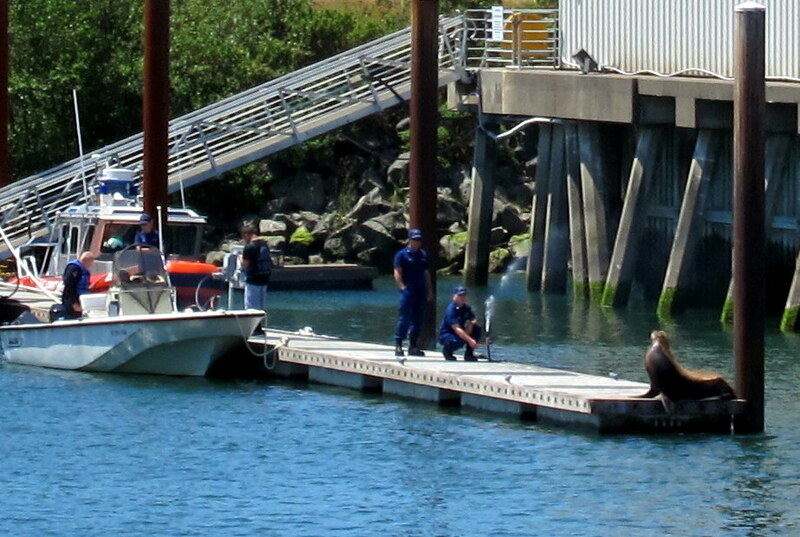 When the brave Coastguardsmen aren’t out saving the life of hapless mariners, they match wits with trespassing Sea Lions. I watched this exercise in futility go on for a good half hour…..the stubborn animal seemed to enjoy being squirted by a fresh water hose! Come early afternoon, we were getting hungry, so following the advice of locals, Kit and I made tracks for The Hungry Clam. 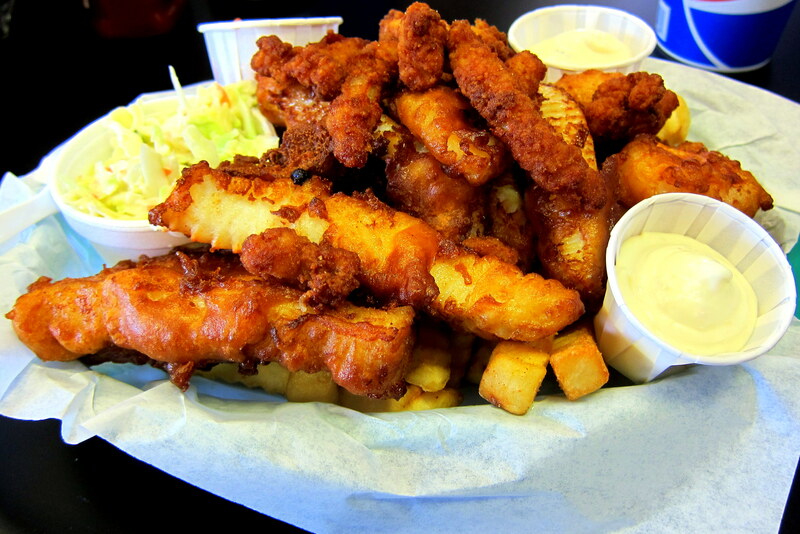 Where the most popular item on the menu is the Seafood Platter. 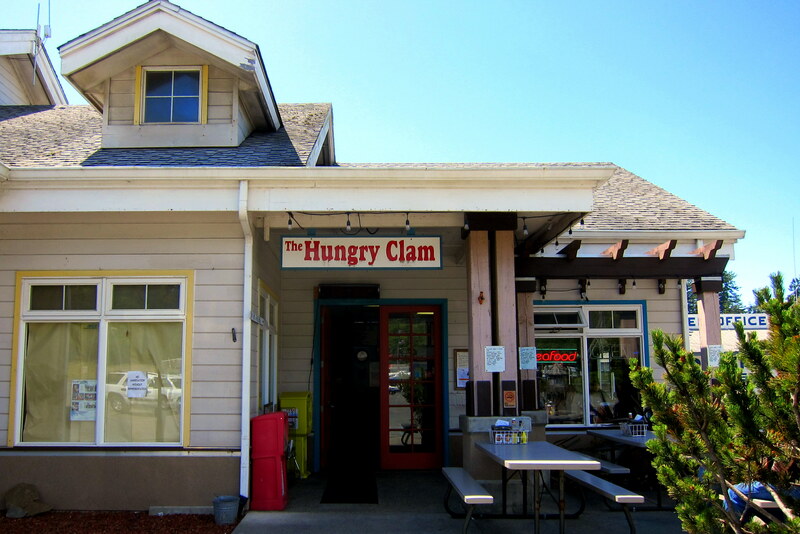 This meal features crab, oysters, calamari and shrimp…..and was incredible! Back in the camper, we discussed where-to-next. The original rough plan was for us to continue up the Oregon coast, then explore the Washington Coast, and then travel on into British Columbia. However, that would surely add another couple weeks before we could turn right and head home. 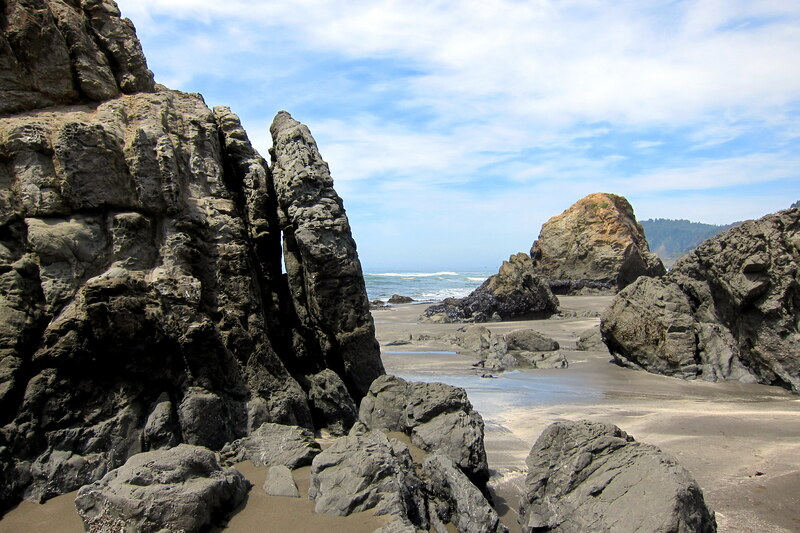 So with some regret, we will head east tomorrow and explore more of Oregon……stay tuned! 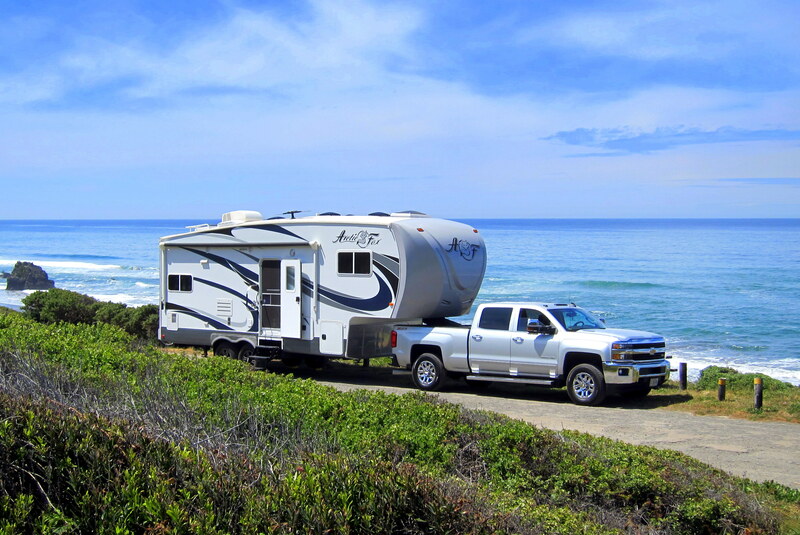 Kit’s Bit’s: Coming across the CA State Beach with minimal camp spots was a delightful surprise! Especially, after only driving 50 miles… No wonder it’s taking us so long to make time on this trip. Camping right on the ocean is such a treat. The cool onshore breeze, birds squawking and waves crashing onshore. It doesn’t get any better than this. Fortunately, we are able to get by without electricity, water and sewer. We could have easily stayed another couple of nights but didn’t want to get further behind on getting home. We happen across these opportunities more often; this is why we aim to travel with little or no itinerary. We have less guilt about taking advantage of these opportunities that pop up in front of us. We will….and you folks as well! Life is to short to race through it!! The scenery is breath-taking! I just love water views. Also, I imagine the first tasting of lobster had more to do with survival than anything else. Yep, good point…..however there are so many more appetizing critters about?!?! THE CHETCO RIVER WAS NAMED AFTER MY GREAT, GREAT, GREAT GRANDFATHER. 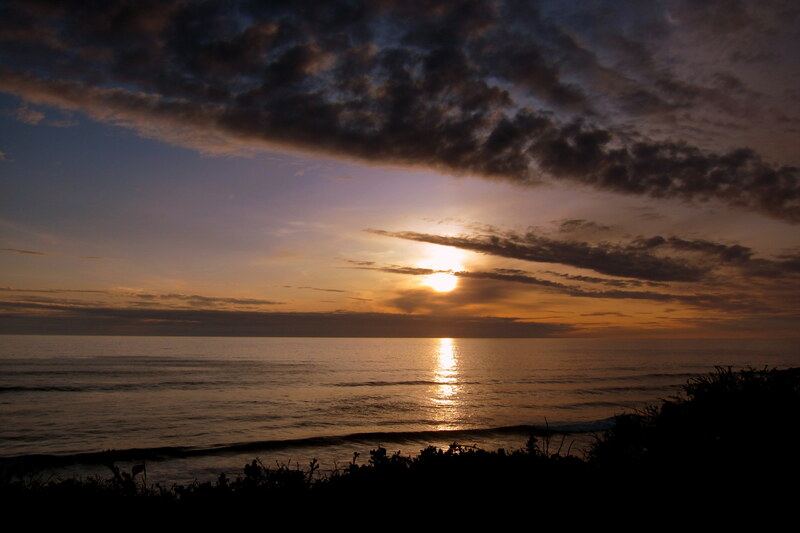 WHAT HAPPENED TO THE BIG SUR, JEANNES FAVORITE WEST COAST LOCAL. SUSPECT THAT YOU’RE NEARING HOME BY THIS TIME. We explored Carmel, Big Sur and the Monterey Peninsula a while back, so picked up this year north of San Francisco. Laughing is good for your health…and you have such a great laugh!!! As always, we are thoroughly entertained by your dialogue, Bill! And Kit offers food for thought as well! Enjoyed seeing the California coast through your eyes…we did that trip on a motorcycle back in the late 1980’s…now THAT’s a real adventure, too! Hope we get over that way in the future…..keep on truckin’ Bill and Kit! You still have miles to go before you sleep! I bet that was indeed an adventure!! Have enjoyed the coastal pics so much. Great shots. be safe and happy trails. Thanks! Hope you folks are doing well and enjoying the summer. Please stay in touch!! Hey Bud, great to hear from you! 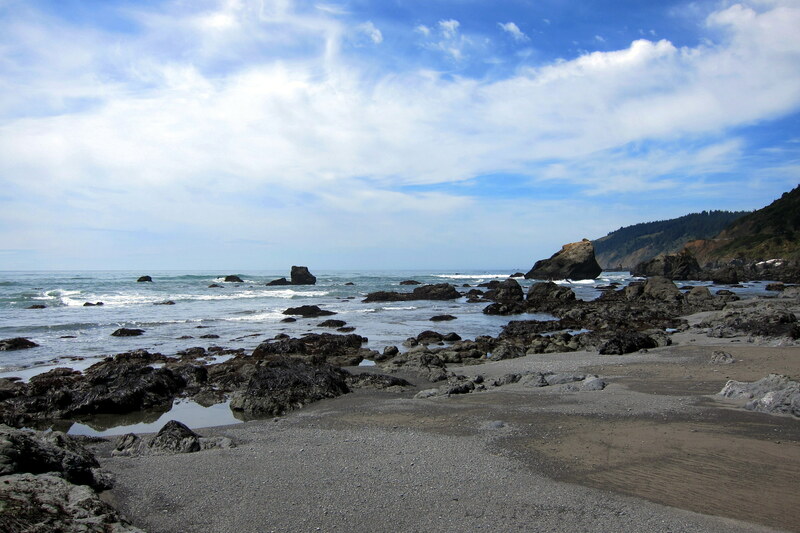 It’s been quite a while since we’ve explored the Northern California coast as well. 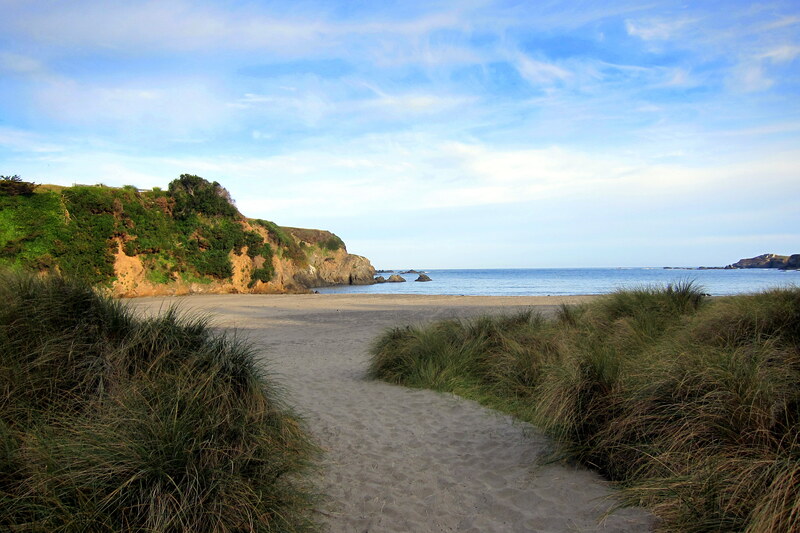 Actually, we like it better than the southern beaches we grew up on!